2T - $49.99 Only 1 left! Become Sesame Street's cute little muppet who wishes to become the number one fairy in town with this bright Deluxe Abby Cadabby Costume. This costume comes with a wand, headband, detachable wings, and a dress. The 100% polyester sleeveless dress is a pretty robin's egg blue and features Abby Cadabby's face on the chest surrounded by a velvety material. Under Abby Cadaby's smiling face, it says "ABBY CADABBY" in hot pink glittery letters. Blue and Violet chiffon strips lay over the dress and are covered in silver glitter. There are chiffon ruffles around the collar. There are two velcro tabs in the back of the dress where the wings attach. The pink, plush glittery wings have purple detailing inside of the wings. The included headband has felt daisy flowers attached to the hot pink and purple strings that are fastened in a way to look like Abby's pigtails. The wand is made from plastic with bright pink, blue, purple, and gold, ribbons attached to it. 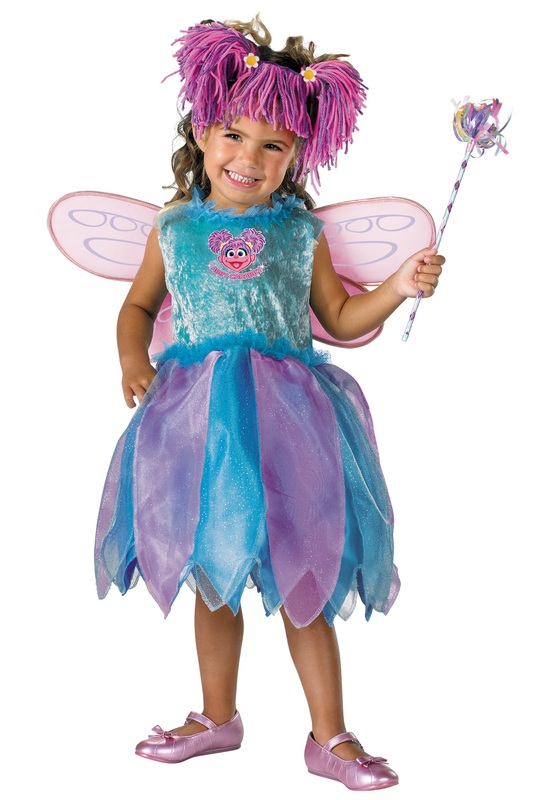 Cast a magical spell over your neighborhood in this cute Deluxe Abby Cadabby Costume.